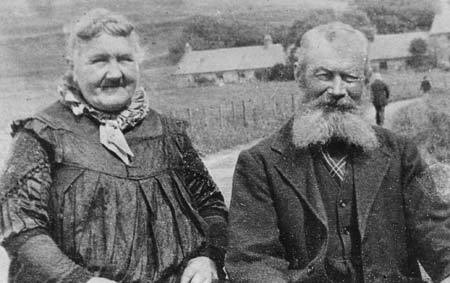 Moses Wood was born at 66 High Street Stonehaven, Kincardineshire on 7th November 1883 the son of fisherman, George Wood and his wife Elizabeth. On leaving school he engaged in farm work and in the Census of 1901 Moses is found in the Bothy at Newmains of Fetteresso. A pre 1914 photo of Pte Moses Wood in tropical uniform, possibly taken c 1905. In 1904, aged 21, he joined The Gordon Highlanders and saw service in India and Egypt. On leaving the army, probably after seven years with the colours, Corporal Wood found employment with the General Post Office and it was this work which brought him to Kennethmont. A popular man in the district he had been working as a postman in Kennethmont for some time when he was recalled to the army following the outbreak of war in August 1914. Being an experienced soldier he spent three months drilling recruits at Aberdeen, being promoted to the rank of Sergeant, before leaving for the Front on 17th December 1914 to join the 1st Batt, Gordon Highlanders. The 1st Gordons had been alternating between billets at La Clytte and front line trenches near Vierstraat since January 1915 being relieved by the 2nd Suffolk Regiment. The battalion received new drafts at the beginning and end of January. 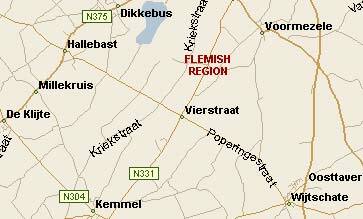 On 27th January 166 men arrived at the front with " very little training ". 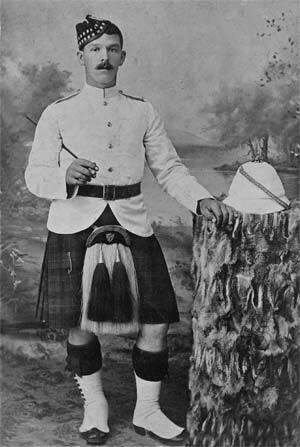 February 1915, Blue Balmoral bonnets issued replacing the Glengarry, but not to be worn in trenches until Khaki covers arrived; too conspicuous. 26/2 - Heavy mist in morning which cleared about midday. Hostile artillery again shelled K2 ( name of trench) but did no material damage. One Sgt and one Pte killed by rifle fire. Inter company reliefs took place at night without casualty. 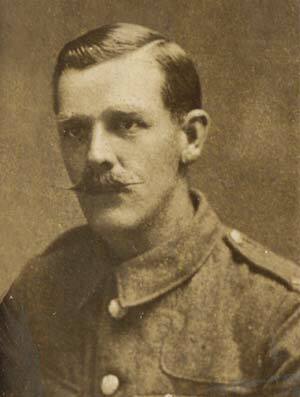 The Sergeant killed on 26th February was, without doubt, Moses Wood. He was struck in the head by a rifle bullet as he got out of a dugout or shelter. It is quite likely that Moses and the private who also died that day were victims of an enemy sniper. During the early months of 1915 the Vierstratat section of the front was relatively quiet. New arrivals unaccustomed to trench duties, which involved moving about bent double and avoiding the temptation to look over the parapet, did not often get a second chance if they provided the slightest target for an enemy sniper. It is known they were active in the area at the time and most often their unfortunate victims received a head wound. Records show that only two men from 1GH died that day. The other man was 3/5916 Pte Wiliam Gray of Methlick. The section of Voormezeele Cemetery where Moses and Pte Gray are buried was created after the Armistice by concentrating burials from battlefield cemeteries in the surrounding area. Moses will have been originally buried by his comrades to the rear of the front and the grave clearly marked with his name, service number and unit details. It was the practice of the time to commemorate a death on a Memorial or Death Card. The card was folded, the inside and front are shown above. It bears a picture of Moses and details of his death and a verse. The following accounts are from local newspapers of the time. Sergeant Wood was in the trenches with his company, and was struck on the forehead with a bullet just as he was getting out of a dug-out. He was quite unconscious and suffered no pain. I would be glad if you would tell his father how deeply grieved I am at the loss of one who was a gallant man and a good soldier. We have a little band of men from Stonehaven serving under my command and in this Battalion. How I wish there were more, but I dare say a great number have gone to the Territorials, or else the new army battalions. This is a rather trying time, but it would be much more so if one had not got such a splendid lot of men as I have under me. I hope some day I may see you and the old town again but there is much to be done and gone through before that day comes. Yours Very Sincerely, Walter Baird. Dear Sir :-- I very much regret to tell you that your son, No. 9630, Sergeant M. Wood, was killed in action on the February 26, while the battalion was on duty in the trenches. He was shot through the head by a rifle bullet, and died about 15 minutes later. I am sending you all he had on him at the time, also his small book. Your son was a gallant non-commissioned officer, and I very much regret losing him. I buried him myself in the evening, and his grave is distinctly marked by a wooden cross, marked with his regimental number and name. Please accept my deepest sympathy." Sergeant Wood was a son of Mr and Mrs Wood, fisherman, Old Town, Stonehaven, he was a farm servant, but in 1904 joined the Gordon Highlanders, then being 21 years of age. He saw service in India and Egypt, being made Lance-Corporal and Corporal. 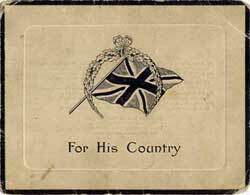 At the end of his service he was employed in the post office Huntly, but on the outbreak of war was recalled to the colours, and for a time was engaged drilling recruits at Aberdeen, when he was made Sergeant. He left the city for the front on December 17 last. Much sympathy will be for his parents, who have other two sons in the 7th Battalion Gordon Highlanders, and a son-in-law in the R.F.A. in Aberdeen. Sergeant Wood was in the trenches with his company and was struck in the forehead with a rifle bullet just as he was getting out of a dug-out. The poor fellow was killed instantaneously, and suffered no pain. I would be so glad if you would find his father and tell him how deeply grieved I am at the loss of his son, who was a gallant man and a good soldier. "I very much regret to tell you that your son, No. 9630, Sergeant M. Wood, was killed in action on the 26th February while the Battalion was on duty in the trenches. He was shot through the head by a rifle bullet, and died about 15 minutes later. He was quite unconscious from the moment he was hit. Your son was an excellent non-commissioned officer, and I very much regret losing him. Please accept my deepest sympathy." 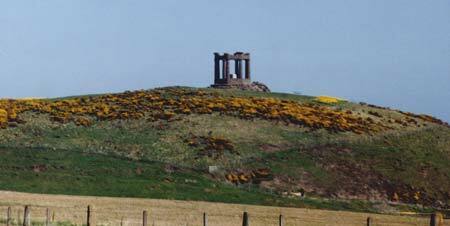 Sergeant Wood, who was well known in the Stonehaven district, was with his regiment in Egypt and India. After serving his time in the Army he was employed as a postman in the Kennethmont district, where he was exceedingly popular. He was unmarried, and is the first Stonehaven man to be killed in action. 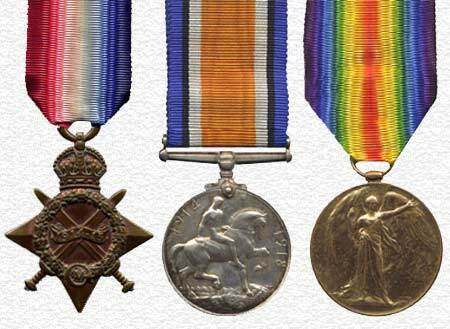 Moses Wood was awarded these medals for serving his King and Country in The Great War. Moses qualified for the 1914-1915 Star (left). It was awarded to all personnel (including naval) who served in any theatre of war between 5th August 1914 and 31st December 1915, other than those who had already qualified for the 1914 Star. Moses is commemorated on the Aberdeen City War Memorial Roll. His address is given as Torry, Aberdeen. 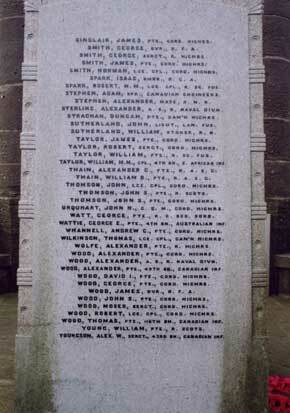 Moses Wood is also commemorated on the War Memorial of his home parish of Dunnottar. 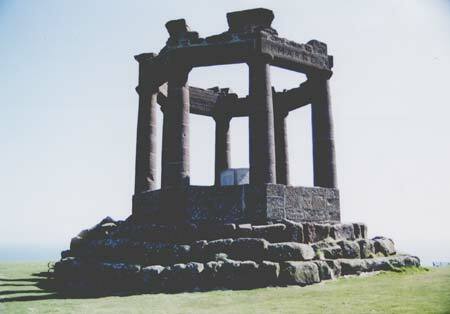 The memorial is sited on Black Hill and overlooks the town of Stonehaven. The granite block within the columns of the memorial bears the names of the Fallen on it's sides. The names of those with the surname Wood.